Add shape and dimension to your property with a retaining wall. Rice’s creates functional and attractive areas—even on steep properties. 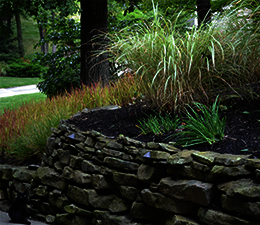 From small garden walls to large boulder barriers, Rice’s incorporates durable retaining walls to fit your landscape. Our expert landscapers start a firm foundation and consider erosion control in each design. Create a level space, permanent seating or a natural boundary. No matter its function, a retaining wall promises to enhance your landscape for years to come. Combined with Rice’s Estate Landscape Management service, your property will be the envy of the neighborhood year-round.